It’s odd that the platform underneath 30th Street Station smells of cotton candy. It’s faint but it’s definitely there. We’ve stopped to switch engines – from diesel to electric. I can observe the yard workers in what look like miners’ helmets (complete with headlamp) couple the new locomotive to the passenger cars. A guy in jeans hops down between the oncoming engine and the business class carriage and uses a large hammer to move this metal bar upward, to smash that link into place. I bet he likes working here, and I wonder how long he’s been doing this job. The rest of the trip will be quicker than the first few hundred miles (across Pennsylvania). It was beautiful. 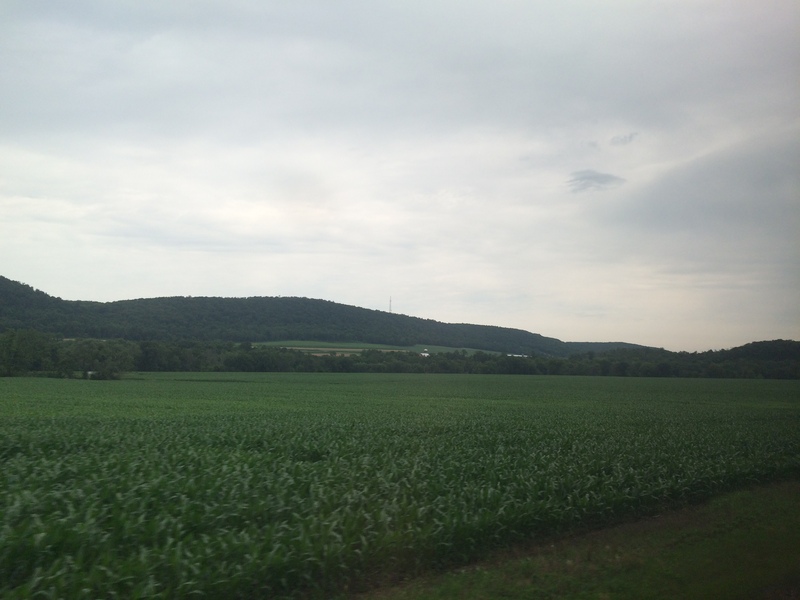 Pennsylvania farmland aboard the Amtrak Pennsylvanian line. I was hoping to snap a photo of a Mennonite farm – we passed several. They stand out. The men are riding plows pulled by horses, the women walking through the fields (wearing flowing dresses and white bonnets) or hanging laundry behind their wooden houses. I get the feeling I’m invading by even wanting to take a picture. I have the thought, also, that the train line has already encroached significantly in so far as it cuts right across their farmland. They can’t exactly ignore the outsiders. The woman across the aisle is going on about politics, describing how things have gone downhill since Reagan, and how we will all perish if we don’t stop Sharia law from taking over our country (as it apparently is right now). She wonders whether or not World War III will be caused by American weakness, and she wishes we’d step up and show Russia who’s boss and who’s to do as they’re told. This conversation wouldn’t be so frustrating to hear were she not speaking to a Brit. What an impression she’s making, claiming explicitly to speak for “the majority of us.” I hope his politesse serves only his humoring her on behalf of his nation, as unofficial ambassador, though I wouldn’t engage in such nonsense were she seated beside me. I wonder if she’s ever read anything or if she just parrots what she hears. I wonder whether or not she realizes she’s endorsing “socialistic ideas” by riding this government-subsidized railroad. Good grief. Arrived in New York. “E” train to Queens and the hostel. When we arrive in New York, 9 hours after leaving Pittsburgh, I’ll arrive in the middle of Manhattan rested and relaxed. This experience differs greatly from trips by airplane. Instead of the two-plus hours in airports, waiting in security lines and hurrying to the gate, ninety minutes on a plane, cramped and unable to move even my knees far enough out of the way to reach my computer (which is smashed under the seat in front of me), ninety more minutes to reach the city… I’ve been laying around, stretching out, wandering to the café car, and meandering back as the time and scenery has flown by peaceably, just enjoying the ride and writing without interruption. 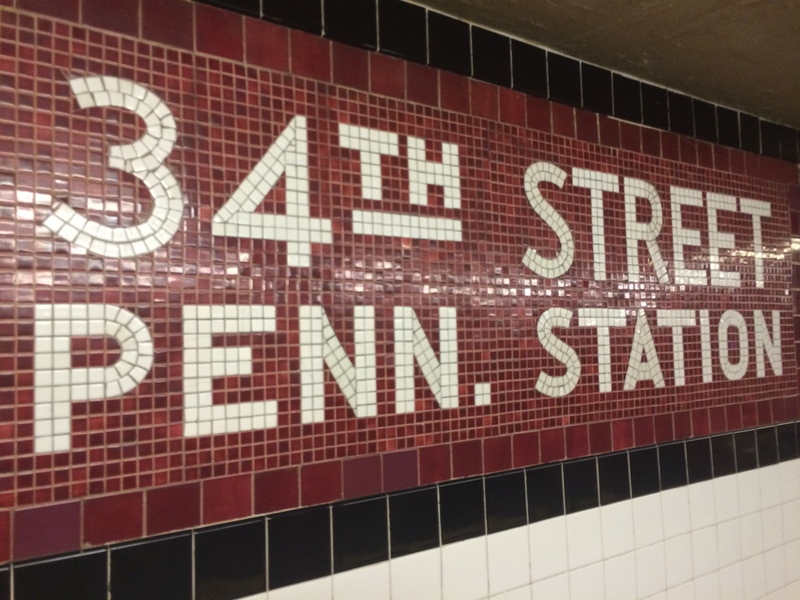 The hostel is one train stop out of Manhattan and into Queens. The view from the roof is spectacular. 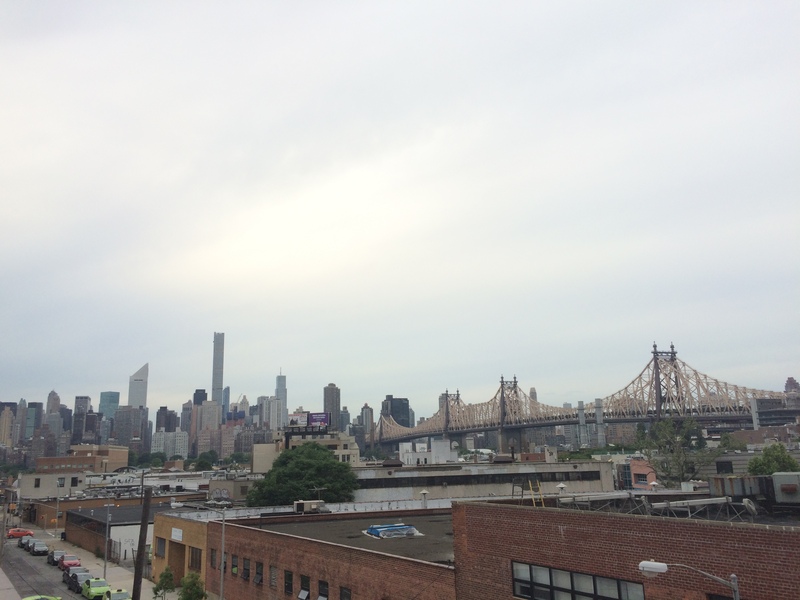 View from the roof of the Local NY Hostel in Queens. 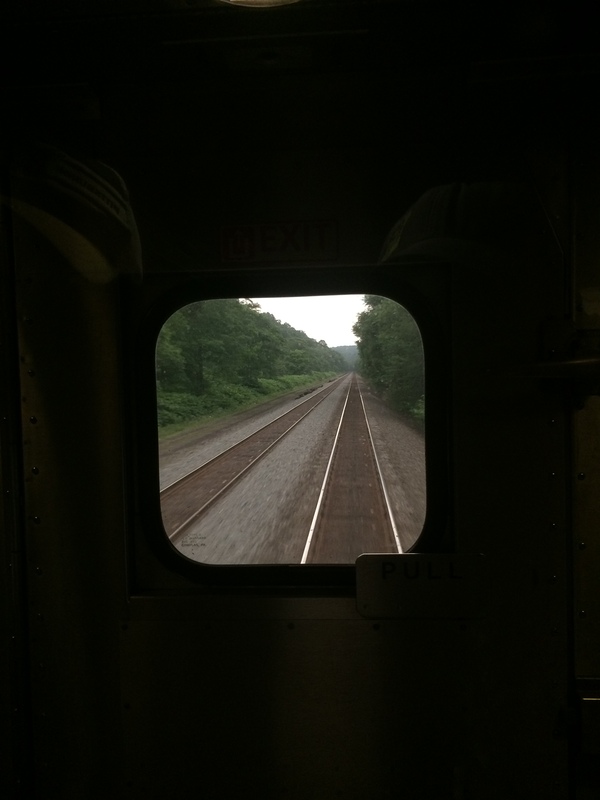 This entry was posted in 2015, Travelogue, Travelogue 2015 and tagged Amtrak, farms, New York, NYC, Pennsylvania, Pennsylvanian, rails, Slow Travel, subway, train travel, trains. Bookmark the permalink.